Once upon a time in a galaxy 12 million light years away, a tiny white dwarf star went supernova, and for a few fleeting weeks was elevated in brightness to outshine the rest of the stars in its galaxy combined. The far, far away galaxy is called Messier 82 and lies in the direction of the constellation Ursa Major (Big Bear, Big Dipper). Also known as the "Cigar Galaxy," owing to its long narrow shape and maybe its ashy appearance in small telescopes, M-82 has been known to us since the late 18th century when Charles Messier observed and cataloged it during his search for comets. The supernova, 2014-J, was first noticed on January 21st, though may have been visible to us as early as the 14th. Appearing now as a bright dot set in the glow of the Cigar, 2014J has been captured by many telescopes the world around. Chabot Space & Science Center's 36-inch reflector, Nellie, has also been affording visitors a peek through the eyepiece during our Friday and Saturday night observing hours. 2014J has been identified as Type 1A supernova, a special and very useful kind of stellar explosion. An "ordinary" supernova occurs when a massive star runs out of fuel and can no longer support its bulk against its own gravity. With the forces of nuclear fusion in its core suddenly snuffed out, it collapses and ignites the leftover core material in a sudden frenzied burst of fusion. A Type 1A supernova arises not from a massive star shoving off its mortal coil, but from the remnant of a dead, sun-sized star that has become a sort of ticking time bomb. A white dwarf is the remnant core of a dead star that in its life was around the size of our sun. In the after-life scenario for such a star, its outer layers of gas are blown gently into space as an expanding "planetary nebula". Its extinguished, but still hot core contracts into a dense ball of mostly carbon and oxygen roughly the size of the Earth. It's hot because it retains the original core's heat energy, though over time will cool down like a fading ember and go dark. Sometimes a white dwarf belongs to a binary star system: a pair of stars dancing in mutual orbits. If the white dwarf and its companion star are close enough to each other the dwarf can draw material from the other, slowly adding to its mass. But just like the load capacity of a standard elevator, a white dwarf has a maximum mass limit equivalent to 1.38 times the mass of our sun (called the Chandrasekhar Limit, after Indian-American astrophysicist Subrahmanyan Chandrasekhar). If a white dwarf's mass exceeds this limit…well, not to put too fine a point in it, boom! The straw breaks the camel's back; the overweight white dwarf experiences a sudden, rapid, and violent collapse, stoking the fusion of much of the carbon and oxygen in its core. And a Type 1A supernova is born. Since each and every white dwarf that blows in this fashion has exactly that same critical mass, the power of all Type 1A supernovas are always exactly the same—in contrast to those "ordinary" stellar supernovas whose strengths vary depending on the mass or the dying star, among other factors. 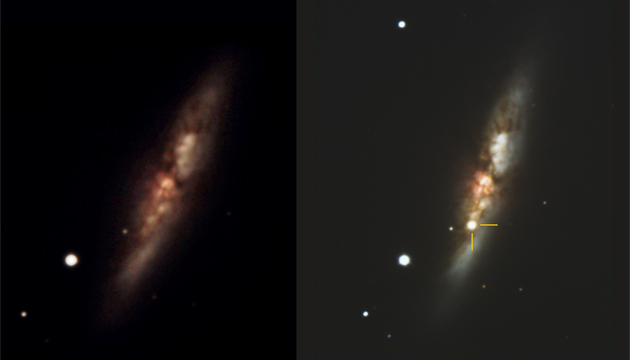 Type 1A supernovas, then, are very useful as standard reference beacons for measuring the distances to the galaxies that host them. All we have to do is measure a Type 1A supernova's apparent brightness, compare it to the known absolute brightness for one, then we can calculate its distance with good accuracy. In fact, it is this technique that has allowed us to determine the size and structure, and ultimately the age, of the universe itself. 2014J will be fading in the week or so ahead. If you come by Chabot on a Friday or Saturday evening in the near future you may be lucky enough to glimpse the final epitaph for what is now a long dead star — dare I say death star -- in a galaxy far, far away…. Go rebels!